Audio - Alarms - Navigation - Electronics (2011 +) Member discussions about Charger audio, alarm and navigation systems and other electronics take place here. NOTE: I wanted to thank user "tanbam" for these instructions, and for his permission to use them to start this thread! 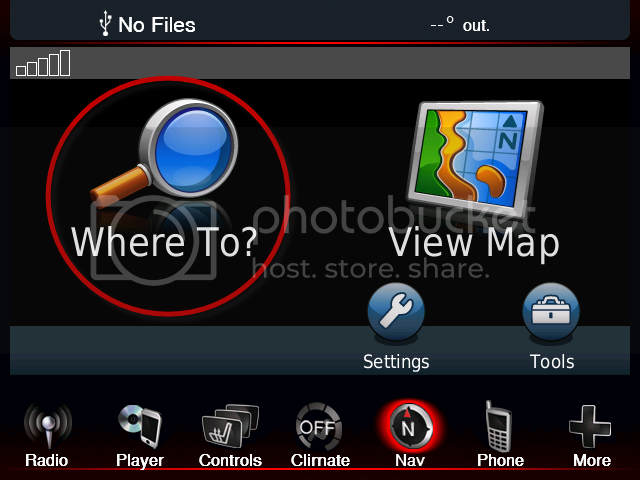 (1) Compatible Garmin Nuvi which has 3D maps and junction views. Begin by plugging your Nuvi into the computer and running GARMIN Express. The program will let you update your Nuvi software and will install the latest map update. This will take some time, so just let it do its thing. After the Nuvi has been updated and has the latest maps, you must enable the Mass Storage feature so that you can browse the files using your computer's file explorer. After this is done, your Nuvi will show up in your computer like a normal USB flash drive. This only needs to be done once. 1) Disconnect the Nuvi from the computer. 2) From the main, "Where To?" screen, tap the "Volume" button. 3) Tap and hold the upper-right corner for about 10 seconds to enter the Diagnostics Page. 4) Scroll down and tap "MTP Settings". 5) Select "Mass Storage" and tap the "Save" button. 5) Tap the back arrow button twice to go back to the main screen. 1) Ensure that the computer is set to "Show hidden files, folders, and drives", and that "Hide extensions for known file types" & "Hide protected operating system files" are both unchecked. This will allow you to easily find the Nuvi files and avoid confusion. 2) Plug a blank USB stick into your computer and create a folder named "Garmin". All of the update files will go into this folder, regardless of where they came from in the Nuvi. Inside the Garmin folder, create two more folders named "ASR" and "JCV". 3) Open the Nuvi 'drive' and browse to the ".System" folder which should be visible at the top of the list. If you don't see it, go back and double-check that step 1) was completed properly. *Note that these file names are ONLY for 2020.10 map. *Note that this file name is ONLY for the 2020.10 map. **Note that there are three different versions of the JCV file, determined by size! The above listed is the MEDIUM sized one! Some folks may notice that this does not include the full set of update files that come with a Nuvi update, however, these are the only files that are required for the CTP11/12 system. The other files will just be taking up unnecessary space. There are two programs that you will need to generate the unlock code for your map/car combination. You will need to generate a new code for each new map. The first program is called GMapTool, and it is used to identify the FID number for each new map. To use this program, install it to your computer. After it is installed, open it and you will be presented with a window. 1) Drag-and-drop gmapprom.img from the USB stick into the blank area under "File Name"
2) Click the "Info" button. 3) Record the FID number. After you get the program, open it on your computer. 1) Enter your 10-digit Device (UNIT) ID code in the "Enter your Unit ID here:" box. 3) In the new window, enter the four-digit FID number in the "FID (or MapID):" box and click "OK". 4) Click the "Generate" button in the bottom left corner. 1) Toggle the Start button to the ACC or RUN positions. The car engine needs not be running, but be aware that the car will turn itself off in the ACC or RUN positions after a period of time. It is critical that you don't allow the car to turn off after the update process begins. Either babysit it by periodically cycling the Start button to reset the timer (make sure the doors are closed when doing this) or just go for a drive while the map is being updated. The update can take more than an hour, so plan accordingly. 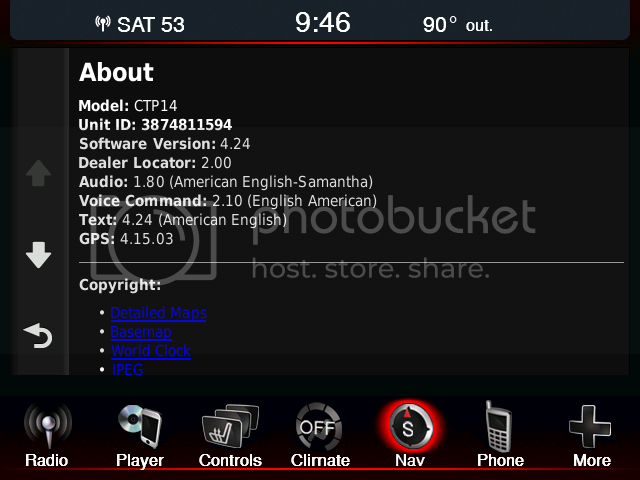 2) Go to the navigation screen and plug the update USB stick into the USB jack in the center console. The radio will recognize that an update disk has been inserted, and will begin validating the files on the USB stick. This may take some time. When the validation process passes, a window will pop up and will ask you if you want to update to the newer map. Proceed through the onscreen prompts, including entering in the 25-digit unlock code that you generated earlier. 3) After this, the radio will reboot and begin copying the new files into the system. This will take a long time, so just let it finish. Occasionally, the radio may lock up at the reboot stage. If it doesn't reboot after a minute or so, you must pull the radio fuse in the trunk. I have no idea why this happens, but nothing bad happens to the radio and you can simply repeat from step 1 again after plugging the fuse back in. 4) After the install process has reached 100%, the radio will again reboot. It may either tell you that the map update was successful or not, but if it got all the way to the end, the update was successful regardless of what it says. 5) Go into your settings and verify that the maps were updated to the latest version. So I finally got around to updating my maps again. Using the same thumb drive and the same donor Nuvi as the last time so I know both are compatible. My .jcv however is not the one you mentioned, mine is named D3191140A.jcv for maps version 2015.20. Downloaded the D306150A.JCV file from Garmin and the validation failed, going to replace it with the file from my Nuvi and try again. Seems to be working with the .jcv file from my Nuvi and not the one mentioned in the how to. Last edited by Davejb; 09-12-2014 at 11:19 AM. That file has a FULL SCREEN junction view, where apparently the other file will look stretched out and fuzzy because it is a smaller picture being scaled up! The file in the link I provided is 815 MB, where I think the other one should be smaller in size! That's the one I used, and it failed validation. Also, the flash drive will be the most popular thing to fail! When I updated mine for 2015.10, I used a specific flash drive, and used that flash drive again to try to update to 2015.20. It kept getting error messages. I finally went out and bought a new drive, and it worked. I am not saying that is what happened specifically with you, but make a note of that for future references! Let us know what the junction views look like with the file off the Nuvi, if it looks small and fuzzy! I doubt it's the drive as it worked fine with the junction view file from my Garmin. I'll see what the image looks like and try again if it looks too bad. The JV file I had was from my last update (2014 maps that I did last year) and it was tolerable to look at so I imagine this one will be the same. As a side note for others, the key generated by Jetmouse doesn't always work so make 5 or six of them and have them all handy, the first two I made weren't accepted. Last edited by Davejb; 09-12-2014 at 05:25 PM. Does the quality of the map differ depending on which Garmin unit you have? Because I've used a few different Garmin units in the past when traveling and I've noticed that there is a slight difference in image quality depending on the unit used. I would assume the navigation's screen resolution would affect the quality of what you are seeing. All maps should be the same, regardless of what unit you are using! Following up after a trip on the highway, the JV images from my Nuvi are perfectly acceptable, not blurry at all that I can tell. Great, glad to hear that they look good!